* Made of PU leather with metel buckles, heavy duty zippers and fabric lining, fashionable and durable. * Multi-pockets provide enough space for your items, including 1 main compartment with 1 interior zipper pocket and 2 interior pockets (for A4 magazines, books, makeup), 2 side pockets (for water bottle, triple folding umbrellas), 2 front zipper pockets (for keys / tissue / charger), You could store your things orderly. * The Back Anti-theft main zipper pocket of the backpack can protect your items from being stolen. * You can carry it as a single-shoulder bag or backpack as there is a removable short shoulder strap. * The lightweight and fashionable backpack can be used as a school rucksack, travel daypack, shopping bag and etc. 1. Faux leather material has natural leather smell, but it will disappear in a few days exposed to outside. 2. 1-2cm error of measuring is a reasonable range due to different measurment methods. 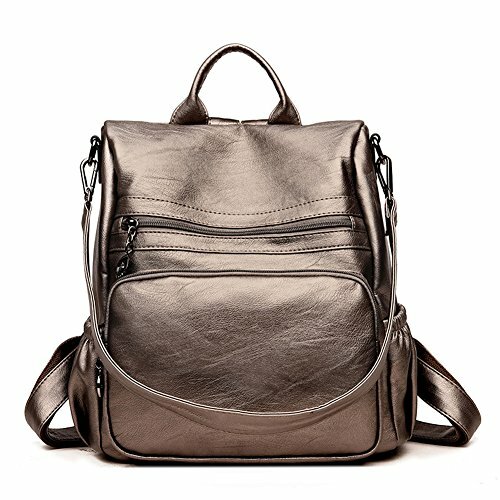 [HIGH-END MATERIAL]: This backpack is made of PU leather with silver metel buckles, heavy duty zippers and fabric lining, which is fashionable and durable. [WELL-DESIGNED] The straps of backpack is adjustable.And you can carry it as a single-shoulder bag or backpack as there is a removable short shoulder strap. [DIMENSIOIN & WEIGHT]: (L) 11.81 x (W) 5.9 x (H) 12.59 inches, 1.32 pounds. It's easy and lightweight for you to carry everywhere you want. [PRACTICAL STRUCTURE]: 1 main Anti-theft zipper compartment with 1 interior zipper pocket and 2 interior pockets, 2 side pockets, 2 front zipper pockets.Multi-pockets could hold your 9.7" iPad Pro, tablet or a laptop 10" and under, A4 magazines, cell phone, umbrella, water bottle, house keys and other tiny items. If you have any questions about this product by Guangkuo, contact us by completing and submitting the form below. If you are looking for a specif part number, please include it with your message.